Almost every time I go down to the ranch, there is a surprise waiting for me. 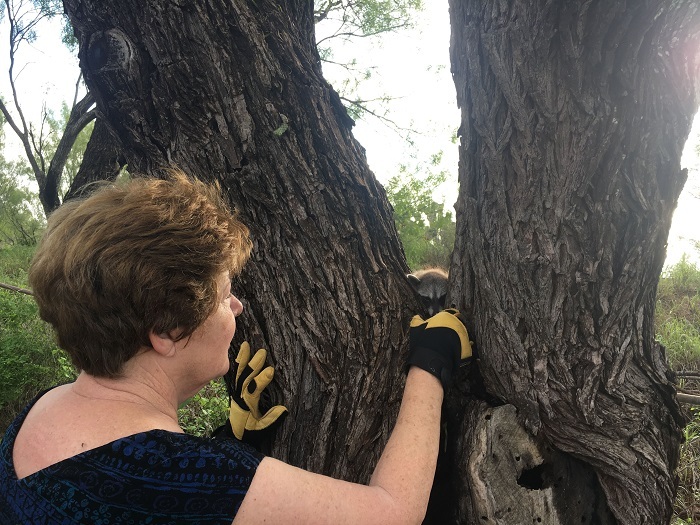 Sometimes the surprises are good–like baby owls nesting in a tree–but sometimes the surprises are, well, less than welcome. Like that one time my mom opened the kitchen cabinet to find a 3 foot rat snake. But this time, the surprise greeting us when we walked in the door will forever stand out. If you follow me on Instagram you may know where this story is going. If there is the slightest crack in your house in the country, it means one thing: critters are getting in. By the time you find the hole or crack, you’re too late! No telling what a) created the hole b) was currently taking up residence in the roof. I called our contractor and a little over a week later, he went down to fix it. When we walked into the house, he said he had something to show us. There on the floor under the hole in the ceiling were three raccoon babies that had fallen through the hole. They were alive and well, and very tiny and cute! My mom decided it would be best to move them to a tree outside, so we did. 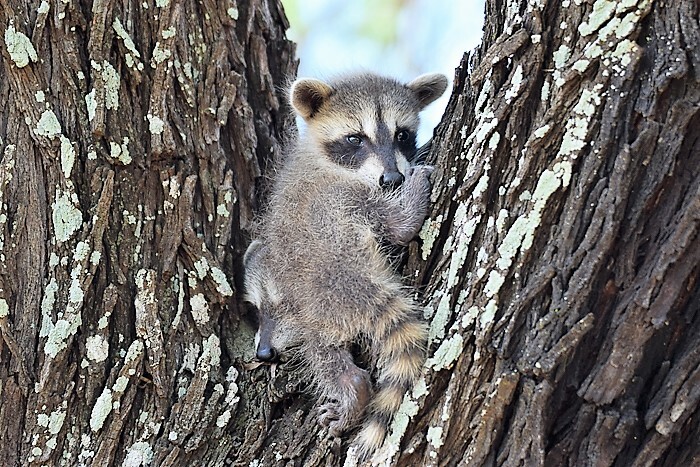 It then occurred to us, where was the momma raccoon? If she was in the ceiling, we couldn’t patch up the hole with her inside and trap her in there, but we had no clue how to get her out. I phoned a friend who has expertise in this whole “country living” and issues that arise, and he advised us to patch up the outside of the house but leave the hole on the inside of the house open for a few days and see if she came down into the house. I was like, Excuse me, WHAT?! See if she comes in the house? But having no better option, that is what we did. We shut the doors to that part of the house so she could not come in to where we were resting our heads at night. In the middle of the night, I woke up to feed Kyle, my newborn little boy who was 5 weeks old at the time. While I was up, I heard a big clang. I didn’t think much of it, assuming it was the ice maker or something in the air conditioner. A few hours later, up again feeding Kyle (#momlife) I heard another clang. I was convinced it was just the air conditioner and I probably was in denial that it could be a live animal in the house. On one hand, I was thinking, OH MY LORD WE HAVE A LIVE RACCOON IN THE HOUSE, and on the other hand, I was relieved we found her. You know you live in the country when you’re GLAD to locate an animal in your house. So my mom and I went and grabbed a broom and a mop to use as defense weapons. 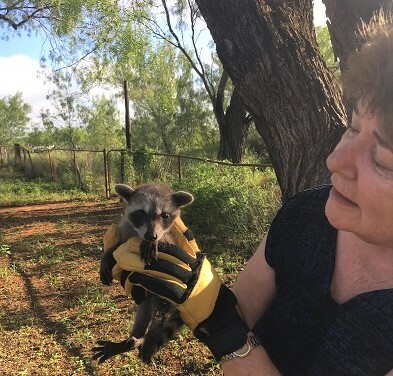 I was prepared to swat that raccoon out of the way if it got near me or my baby! Using some boards and furniture, we set up a channel from the bedroom to the back door for her to run out. We tiptoed and whispered the whole time so not to startle her. When we were ready, I gently pushed the mop under the bed to edge her out in the direction of the door. She moved to under the nightstand. I got up on the bed and slipped the mop down behind the nightstand. Out she came! We were now screaming! The momma raccoon looked up at me with a petrified expression. From the other room you could hear Kyle wailing and Trooper barking. That poor momma high tailed it out of the room, down the channel we had built, out the back door, and over the hill as fast as her little feet could carry her. It took us a while to calm everyone down but we were really glad to know that we would no longer have a raccoon living in our house. That is, until those babies remember this lovely little house they spent their childhood in, and go looking for a crack in our roof to have THEIR babies in. So that was our traumatic animal adventure of the month–and I say “month” because there will probably be another one next month. But I’ll be a lot braver next time now that I’ve faced down a raccoon! 6 Replies to "Our Latest Surprise on the Ranch"
WOW! Believe me, I know for sure, this is one story you’ll be telling your GRANDKIDS one day!!! No joke! That’s exactly what we were saying! So happy to hear it’s, “all clear”, now at the ranch!! While living on our ranch in Llano County I found a snake skin in a potted plant in the bedroom after my kids and I returned from an out of town trip. My husband (then) had apparently been sleeping there while the snake was shedding it’s skin! We never did find that snake! Oh my! We have found a snakeskin as well. It’s a wonder I’m able to sleep down there at all!